FDS Super Mario Bros. (JPN) "-3 stage ending" in 02:48.12 by Phil. This game is Super Mario Bros, the original, but on Famicom Disk System. 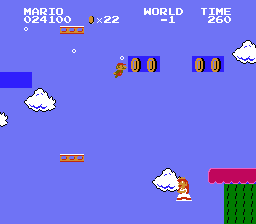 It is much similar to the ROM version of the game, except for one minor difference that is demonstrated here. The −1 stage is completely different. In the NES and Unisystem versions, the −1 stage repeats infinitely and cannot be completed, but in FDS, it can be completed, and then come −2 and −3. The −3 stage in FDS is a castle level, and completing it ends the game, even though it says "princess is in another castle". The princess is not seen in the ending, but she is sighted twice in the −1 stage, as shown in this movie. This is a 43 frame improvement to the previous movie; 42 frames of which were due to a glitch discovered by klmz. For details on this glitch read the submission text of the normal run.